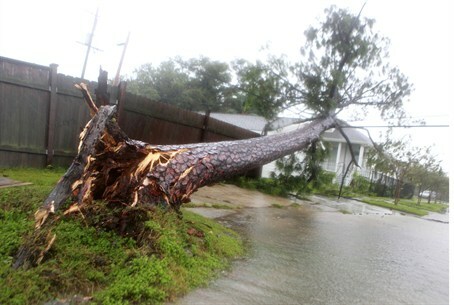 Hurricane Isaac made a second landfall in the wee hours of Wednesday morning over Port Fourchon, Louisiana, leaving 400,000 without power. The massive storm system, packing winds of up to 80 miles per hour, has overtopped a set of levees in Plaquemines Parish, where officials called for a mandatory evacuation. But the barriers built after Hurricane Katrina seven years ago to protect New Orleans have not been breached, officials added, noting that although several levees were overtopped, there were fewer evacuations this time around. As the storm continued to unleash its fury, former Governor Mitt Romney and his wife Ann Romney took the stage on Tuesday at the Republican National Convention in Tampa, Florida. Romney was formally nominated to run as the GOP candidate for president as Hurricane Isaac knocked down trees and ripped out power lines in nearby Louisiana. The hurricane is not yet nearly finished with its reign of destruction – it's crawling north at a speed of only eight miles per hour. According to the U.S. National Hurricane Center, at about 7:45 a.m. EDT, the storm's center was about 50 miles south-southwest of New Orleans. Meteorologists are expecting up to 20 inches of rain in the next 24 hours.